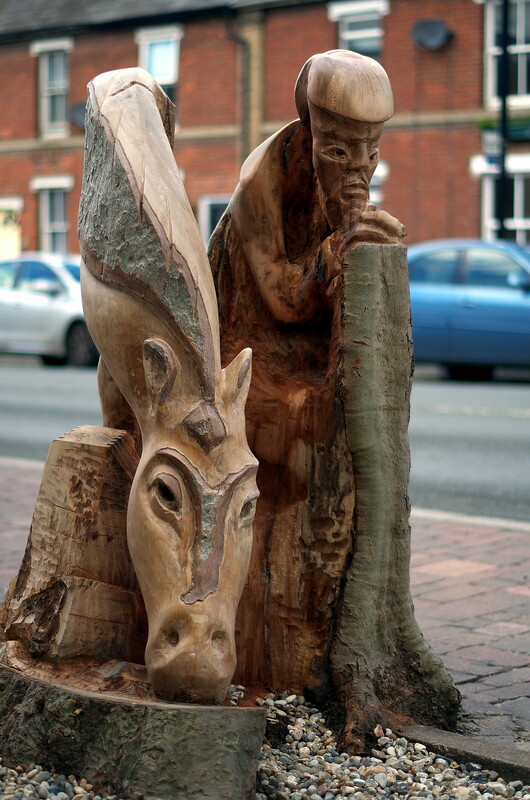 Local wood carver John Williams spent several weeks recently creating a sustainable sculpture depicting Abbot Jocelyn and his horse from the 5ft stump of a felled beetle infested tree. Jocelyn de Brakelond whose name is of Breckland, Norfolk, was a monk who chronicled events at the Abbey of Bury St Edmunds between 1173-1202. The 10th century Benedictine Abbey amongst the largest and wealthiest monasteries in England was later dissolved during the reign of Henry VIII. The carving is located on the south side of Eastgate Street.